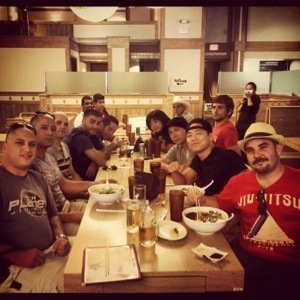 10th Planet Van Nuys UFC 152 meet up! For all my 10th Planet people in the Greater Los Angeles area. 10th Planet Van Nuys is meeting up to watch the fights tonight at black belt, Master Shigeki Matsuda’s world famous, Orochon Ramen. He has a beautiful, brand new San Fernando Valley location. Located on San Fernando, near Orange Grove. If you’ve never been to a team even before, come experience how we get down. We’re tons of fun! Test you spicy skills! Finish Orochon’s signature Spicy #2 in under 30 minute, and forever be immortalized on the wall of Bravery. Many have tried and failed, but your’s truly, Coach Alder is amongst that elite who has prevailed.